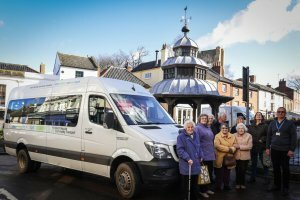 North Norfolk Community Transport (NNCT) is a registered charity improving wellbeing and accessibility in the community, and reducing social isolation. They run friendly and inclusive transport schemes and exist to fill the gaps left by conventional public transport services. The scheme is open to people in the area who are without their own transport and are unable to use public transport, either because of ill health, disability or because there is no service meeting their needs – in North Norfolk there are some areas with no public transport service at all. NNCT is a member of Norfolk Community Transport Association and Community Transport Associations UK. NNCT needed to strengthen their model to ensure access to school transport contracts and to allow them to compete with commercial transport and taxi providers, anchoring their sustainability by diversifying their funding. This meant NNCT needed support to examine their governance arrangements and licencing, and more generally to review their processes to improve sustainability and support growth. Under the Local Sustainability Fund, Eastside Primetimers consultants performed an organisational diagnostic and worked closely with NNCT to examine their model and governance structures. We were able to support them in the application process for a commercial operator ‘O’ Licence, which if successful will expand their service offer and grant them more flexibility to compete against private sector providers and bid for school transport contracts in the area. NNCT also transferred one of their services to another organisation, reducing duplication in the local area and freeing up staff and financial resource within NNCT to focus on quickly scaling up other parts of the organisation that had greater social impact and income potential. And Eastside Primetimers consultants helped NNCT review their memorandum of association, recommended changes to their membership structure, drew up a risk register and assessed their resourcing requirements.